Telemedicine/Telehealth is now available at PMHS. We will soon be launching our Telehealth Hawaii. 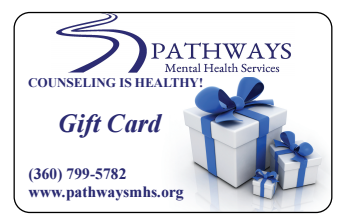 We also offer a Care Card (similar to a gift card) at our Lacey & Longview, WA Clinics. Please inquire at the front desk or call 360-799-5782 or 360-799-4556. Pathways is a Sterling/Cordant Lab Certified CPS/DSHS collection site. PMHS is a proud member of Washington State Coalition Against Domestic Violence (WSCADV) as an Organizational Associate.